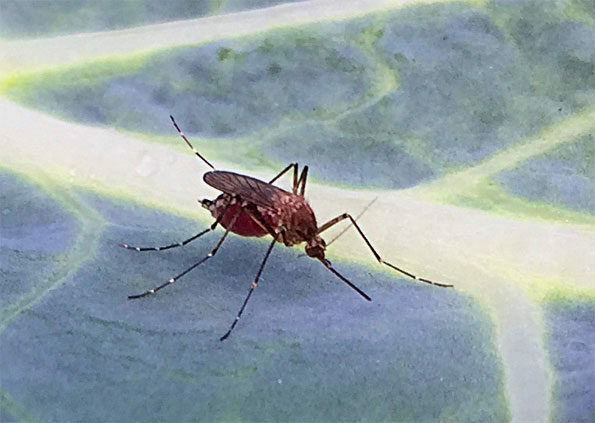 The first mosquito batch to test positive for West Nile virus in Illinois was found in in Glenview and Morton Grove Friday, May 25, 2018, according to the Illinois Department of Public Health. North Shore Mosquito Abatement District staff members collected the mosquitoes in Glenview and Morton Grove last Friday. Last year the first mosquito batch to test positive for West Nile virus in Illinois was in mid-June 2017. Mosquitoes were collected from a North Shore Mosquito Abatement District trap on June 19, 2017 and tested positive two days later. In 2017, there were 90 lab-confirmed cases of West Nile virus infection of humans. The most cases were reported in Cook County with a count of 52. DuPage County and Lake County ranked second with each county reporting six human cases. There were eight deaths in Illinois, and a total of 63 counties had at least one West Nile Virus case of human infection. No human cases of West Nile virus have been reported this year. People over age 60 and individuals with weakened immune systems are at higher risk for severe illness from West Nile virus. The illness that is caused by WNV is known as West Nile fever. Common symptoms of West Niles Virus (WNV) infection include fever, nausea, vomiting, headache and muscle aches. Some or all of these symptoms affect about 20 percent of people infected, and may last from a few days to a few weeks. However, about 80 percent of people infected with West Nile virus do not have any symptoms, and is a big part of the reason that WNV is under-reported. The severe illness that is caused by WNV is known as West Nile neuroinvasive disease (WNND). Severe illnesses related to WNV infection include meningitis (WNM), encephalitis (WNE), West Nile meningoencephalitis (inflammation of both the brain and meninges), and West Nile poliomyelitis (WNP). Least common is WNP, which is characterized by the acute onset of asymmetric limb weakness or paralysis in the absence of sensory loss. Pain sometimes precedes the paralysis, which can occur in the absence of fever, headache, or other common symptoms associated with WNV infection. Involvement of respiratory muscles, leading to acute respiratory failure is possible. The severe forms often require life support in an Intensive Care Unit (ICU). There is no specific cure for the severe illnesses, but life support with oxygen, mechanical respiration support and nutrition are required while patients are in a near coma state. Although rare, severe WNV infections can cause unstable gait, high fever with rapid breathing, low oxygen levels, respiratory arrest, severe tremors, brain damage and death. The Illinois Department of Public Health recommend THREE R’s to protecting against mosquito bites that can cause WNV infection. • REDUCE: Make sure doors and windows have tight-fitting screens. Inspect screens and repair or replace screens that have tears or other openings. Try to keep doors and windows shut. Standing water risk reduction includes eliminating or refreshing standing water each week, all sources of standing water where mosquitoes can breed, including water in bird baths, ponds, flowerpots, buckets left outside, wading pools and old tires. • REPEL: For best protection when outdoors, wear shoes and socks, long pants and a long-sleeved shirt, and apply insect repellent that contains DEET, picaridin, oil of lemon eucalyptus, or IR 3535. Consult a physician before using repellents on infants. • REPORT: Notify officials about locations where water is sitting stagnant for more than a week, such as roadside ditches and flooded yards. The local city or village health department or government may have the ability to add larvicide to the water, which will kill any mosquito eggs and larvae. Inland Floodwater (Aedes vexans) or Asian Tiger Mosquito (Aedes albopictus) on Broccoli leaf. West Nile virus is primarily transmitted by mosquitoes, mostly species of the genus Culex, but mosquitoes and ticks have also been found to carry the virus. Aedes albopictus bite diverse host species enabling the Asian tiger mosquito to be a potential bridge vector for certain pathogens such as West Nile virus.